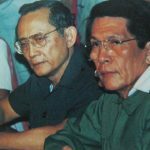 When the smoke cleared after the first People Power Revolution, four heroes emerged—Cory Aquino, Cardinal Sin, Juan Ponce Enrile and Fidel V. Ramos. The latter two figured prominently because of their crucial role in the revolution. Enrile was the secretary of National Defense while Ramos was head of the Philippine Constabulary. Both leaders launched a coup d’etat against Ferdinand Marcos and encouraged their troops to do the same, rendering Marcos handicapped. Enrile would then become Aquino’s Defense secretary but resigned in 1986 because Aquino lost confidence in him after instigating a coup. He then served as a senator in 1987 and was even the Senate president from 2008 to 2013. Ramos, meanwhile, was appointed as chief of staff of the Armed Forces of the Philippines and eventually Defense secretary as well. 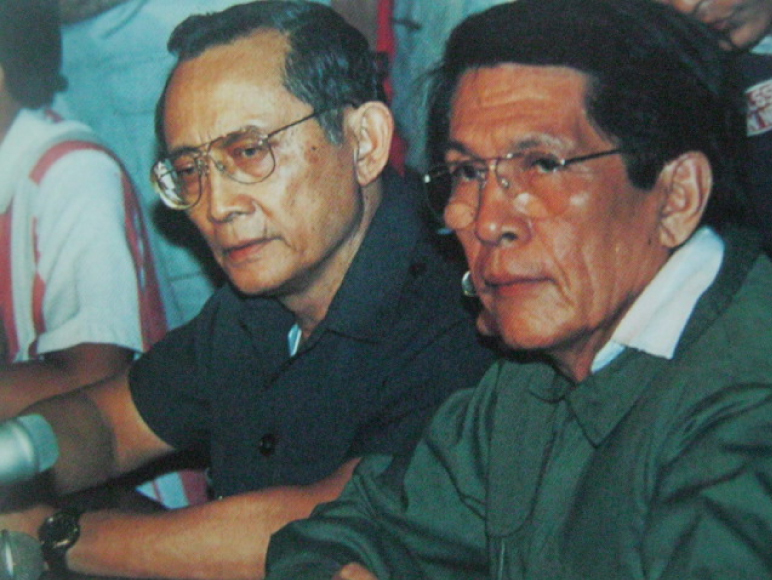 Lieutenant General Fidel V. Ramos and Defense Minister Juan Ponce Enrile announce defection from the Marcos administration in 1986. He ran in the 1992 presidential election, narrowly beating Miriam Defensor-Santiago. Enrile, for his part, won 23.58 percent of the vote, the lowest plurality in Philippine election history. On Nov. 8, 2016, the Supreme Court rejected petitions to stop the burial of Ferdinand Marcos. Fourteen justices voted for a 9-5 decision. The Supreme Court said President Rodrigo Duterte has the power to decide on the use of land within public domain and that Marcos was a former commander-in-chief, former soldier and former secretary of National Defense. They also said the late dictator has not been convicted by any final judgment and that all cases were civil in nature. Ten days later, the remains of Marcos were buried at the Libingan ng mga Bayani in a “private and intimate” ceremony. This sparked opposition from victims of atrocities during Martial Law, and Ramos urged the Marcoses to admit wrongdoing and apologize to the victims. Ilocos Norte Gov. Imee Marcos said they would not admit anything, arguing that they were still children when the atrocities were committed and did not know of such. “In my heart, if in any way you have hurt someone, you should say sorry even if it’s not intentional, even if it was not policy. Okay lang naman sa’kin, pero yung admission of guilt… Unang-una, ang liit-liit ko noon. Paano ko ia-admit, hindi ko naman alam?” she told ANC’s “Headstart” in November last year. She went as far to say it should be Ramos who should apologize and admit his faults since he has direct command with the Philippine Constabulary. But at a separate press conference, Ramos said it’s impossible Imee did not have an idea since she is a year older than his daughter. “I know how old she is because she’s one year older than my oldest daughter. My oldest daughter at that time, looking at the beginning of martial law, was already 18 years old,” he said. 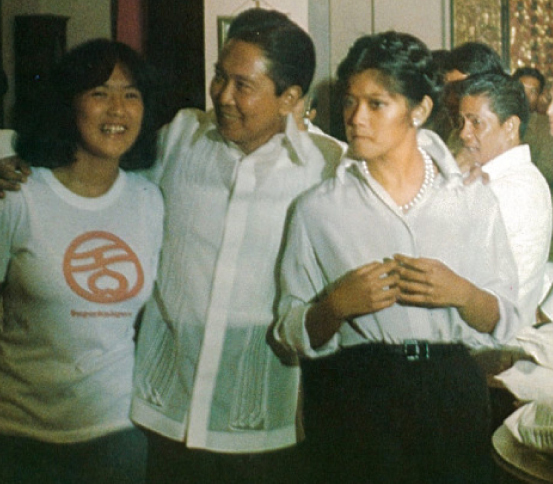 No longer a child: Imee Marcos (right) share a light moment with her father, Ferdinand Marcos, and sister Irene (left), who is wearing a Kabataang Barangay T-shirt in the 1970s. Imee was born on Nov. 12, 1955. On August 31, 1977, she attended an open forum as National Chairman of the Kabataang Barangay. A 21-year-old student from Mapua Institute of Technology, Archimedes Trajano, questioned her appointment to the post. Trajano was dragged out of the venue by Imee’s bodyguards and went missing. His body was found severely beaten. Imee was 21 years old that time. Fourteen years later, Imee would admit to a court in Hawaii that Trajano was tortured by his bodyguards with her knowledge, but argued she can’t be convicted because the court does not have jurisdiction in the Philippines. Imee’s resort to blaming Ramos is not a first. Former Cyprus and Greece ambassador and Manila Times columnist Rigoberto Tiglao said Ramos and Enrile should be held accountable for the atrocities during Martial Law. “Was there a policy of the Marcos regime to systematically kill the opposition and torture them? Or were the human rights abuses exceptional cases, aberrations, similar to cases of police brutality?” he said. He said that he and his wife were arrested and incarcerated for two years and that the arrest orders were issued by Ramos. Francisco Tatad, Marcos’ press secretary also said Ramos and Enrile should tell everything that transpired during that time. “Si Marcos ba ang nagtuturo? Siya bang naglilista ng mga aarestuhin or sila ang naglilista at pinipirmahan lang ni Marcos kung kailangan ang pirma niya?” Tatad was quoted as saying. Ramos, for his part, said he has atoned for his role during Martial Law by leading the coup that stirred the people’s revolt in 1986. Under superior responsibility, the commander is responsible for the acts committed by his subordinates. The doctrine also covers the responsibility of omission. Both Enrile and Ramos were reporting to Marcos, who was the chief commander of the military albeit as a civilian. In 1996, the United States 9th Circuit Court of Appeals upheld a verdict by a Hawaii court which found Marcos responsible for human rights abuses, torture, murder and “disappearances of fellow Filipinos,” a report from the Los Angeles Times noted. The appeals court charged Marcos for military “command responsibility,” saying the principle is applicable to peacetime by agents of a political leader. 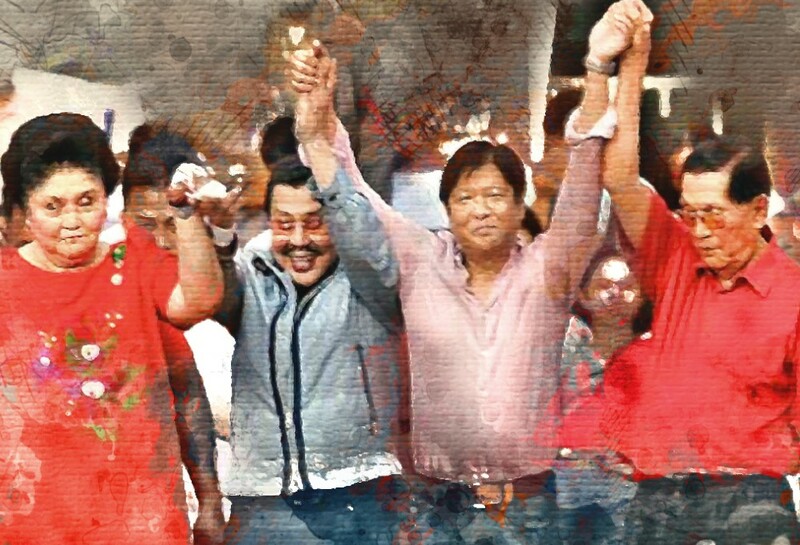 Juan Ponce Enrile endorses Ferdinand “Bongbong” Marcos Jr. for vice president in October 2015. Former University of the Philippines Mass Communications Dean Rolando Tolentino said the top figures of Martial Law must face the proper sanction should they be found guilty. “Sila mismo naglabas na ng sarili nilang revisionist interpretation of that history of Marcos dictatorship,” he said.